HP is joining the race to launch PCs including Intel's 4th generation Haswell Core Processor, with a new range of EliteOne and EliteDesk models designed to suit different office sizes and layouts. At the top end, HP's EliteOne 800 G1 is an All-in-One (AiO) desktop packing up to 16GB of RAM behind its 23-inch wall mountable touch-sensitive IPS display. PCs with AiO designs have found favour with consumers for their ability to save space, and HP is hoping businesses are ready to grab some of the benefits. The EliteOne 800 G1's internal storage can be configured with up to 1TB hybrid SSD as an alternative to a 500GB HDD. Its turbo charged USB 3.0 port enables it to act as a hub, and it it can be hooked up to four displays using an optional graphics card, which is upgradable with up to 2GB of memory. Additionally, it features an SD media Card Reader, microphone and headphone ports, and a DVD rewriter. The EliteOne 800 G1, which ships with Windows 7 or Windows 8, is available from June at a starting price of $1,299 (for the touch-enabled model) or $1,099 (non-touch model). No word yet on UK pricing. HP has also unveiled a range of Haswell-powered desktop tower PCs in the form of its EliteDesk 800 G1 series, which is available in multiple form factors. The EliteDesk 800 G1 Tower is the biggest of the three models. HP is offering it with multiple RAID configurations for users with more than one hard drive to help automatically back up and protect sensitive data. In the middle, the EliteDesk 800 G1 Small Form Factor, which is designed for offices with limited space, includes Intel's Smart Response Technology, a disk cache solution that provides users with similar performance with SSD drives while providing the data storage capacity of larger HDDs. It also comes with WiFi Intel Wireless Display technology, which allows users to connect the machine to projectors and other display units. 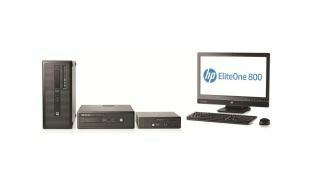 Pricing for the HP's EliteDesk 800 series starts at $815. The models are available from June. Again, no word on UK pricing at the time of writing.